Beginning in May, TOD residential electric pricing on-peak hours shift to 2-7 p.m. (weekdays only). Throughout the year, most customers use approximately 80 percent of their electricity during the lower-priced, off-peak hours. 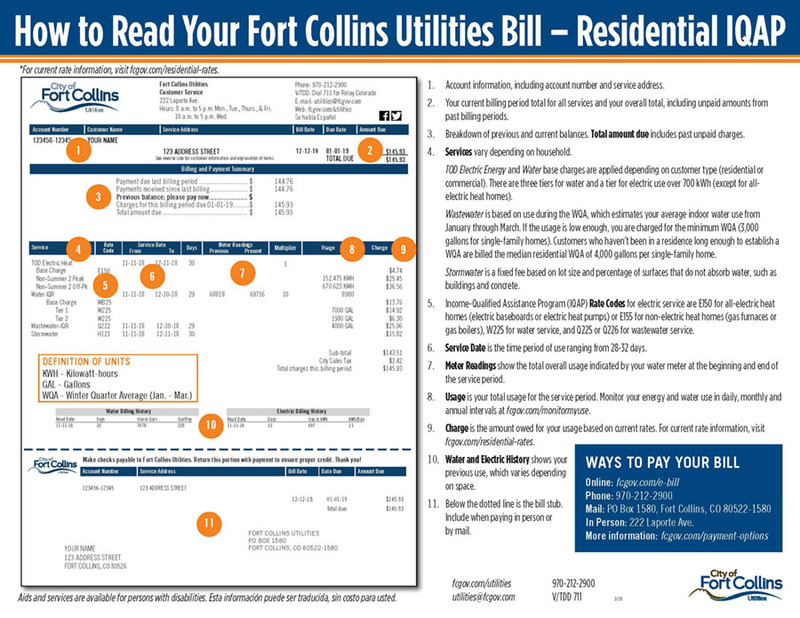 Fort Collins Utilities transitioned to Time-of-Day (TOD) electric pricing for all residential customers in October 2018. TOD has two levels of pricing: off-peak and on-peak, and two seasons: non-summer and summer. 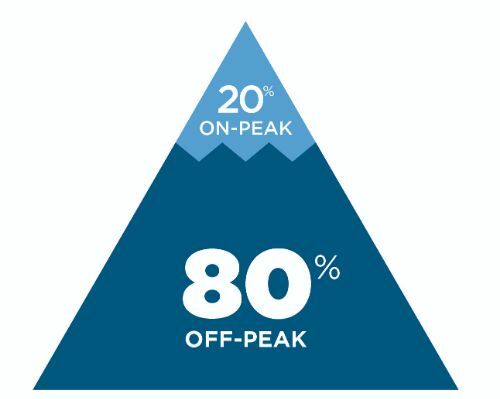 Off-peak prices are approximately 70 percent less than on-peak prices. Save money by shifting your electric use to the lower-priced, off-peak hours or by reducing your use. See below pricing details below. If you use more than 700 kWh of electricity a month, you are billed an additional $0.0194 (1.94¢) per kWh over 700 kWh (except for all-electric heat homes). Click here for a quick, 1-month TOD estimator that allows you to incorporate different electric-use amounts to see how the price changes. Click here to request a 12-month cost estimate based on past electric use compared to TOD pricing. Off-peak prices are approximately 70 percent less than on-peak prices. Save money by shifting your electric use to the lower-priced, off-peak hours or by reducing your overall use. Remember, it’s not just about using less electricity, it’s also about using it at the right time of day. Learn about our efficiency and conservation programs, services, rebates and home energy audits. Keep an eye on your hourly, daily and monthly electric use with our Monitor My Use tool. Check out a Home Energy Monitor from the library to identify which appliances use the most energy in your home, and take action to reduce energy use during on-peak hours. Learn what it costs to operate common household appliances and electronics. Find out more about appliance and electronic electric use and costs with our Home Electricity Use By Room tool. Save approximately 50¢ per load by drying your laundry during off-peak hours. Consider line drying clothing whenever possible to save even more. Run your dishwasher in the morning, later in the evening/night or on weekends. Incorporate stove-free dinners into your week when possible. Whether it's leftovers, using slow cookers, grilling or working in cold meals, there are several ways to enjoy dinner without using your electric stove or oven. Enroll your electric water heater in Peak Partners and automatically shift when your water is heated. Set your thermostat a few degrees lower in the winter months and a few degrees higher in the summer months, especially during on-peak hours. (U.S. Department of Energy recommends 78° in the summer and 68° in the winter). Every 2 degrees higher you set your air conditioner can save up to 14 percent on cooling costs. Try pre-cooling your home before 2 p.m. during the summer and pre-heating it before 5 p.m. in the winter. Choose fans before air conditioning, especially during on-peak hours. Use sunlight to your advantage. In the winter, leave curtains open during the day to naturally heat your home, and close them at night to shut out the cold. In the summer, close curtains during the day while you are gone to keep out the hot sun. Charge electronics and electric vehicles overnight. Reduce ‘vampire’ power waste by unplugging electronics that are not in use or plugging them into a smart power strip. Turn off electronics, such as the TV, computer and video game console, when not in use. Install LED light bulbs, which use 75 percent less electricity than traditional incandescent light bulbs. Turn off lights when not in use and when you leave the room. Time-of-Day Residential Rate Change Request Form. Fort Collins Utilities has verified rate assignments based on whether a residence is heated entirely by non-electric heat sources (gas furnaces or gas boilers) or all-electric heat sources (electric baseboards or electric heat pumps). Residential customers with gas furnaces or gas boilers (approximately 90+ percent of customers) are on the TOD Rate as shown below. Residential customers with electric baseboards or electric heat pumps (those with all-electric heat homes without gas heating) are on the Electric Heat TOD Rate as shown in the 'TOD Pricing - Electric Heat Customers' section. This rate applies to all residential customers who have a gas furnace or gas boiler that serves as the primary heat source. Residences heated with a gas furnace for any portion of the home. Residences heated by hot water baseboards via a gas boiler. Residences heated by a geothermal or mini-split heat pump without backup electric baseboard heat. Additional charge for all kWh used in excess of 700 kWh in any month. Actual charges may vary due to rounding. Residential customers with electric baseboards or electric heat pumps (homes without gas heating) are on the Electric Heat TOD Rate, as shown below, without a tier charge for use over 700 kWh. Customers with gas furnaces or gas boilers are placed on the TOD Rate as shown in the above 'TOD Pricing' section. This rate applies to all residential customers with all-electric heating (electric-resistive) as the primary heat source for the home. Residences heated solely by electric baseboard heaters. Residences heated by an electric heat pump through a central duct system. Residences heated by a geothermal or mini-split heat pump with backup electric baseboard heat. *PILOTs: A 6 percent payment in lieu of taxes that is calculated on electric, water and wastewater rates. PILOTs are a payment to the City's general fund to replace revenue the City would have received from the utility in taxes and franchise fees if the utility were privately owned. Only the primary heating source determines the type of TOD rate for customers, not solar (PV), electric vehicle charging or other factors. For an example of your net metering bill, click here. Solar PV (net metered) customers will continue to receive credits for solar energy returned to the grid, based on the off-peak and on-peak hours as shown below. 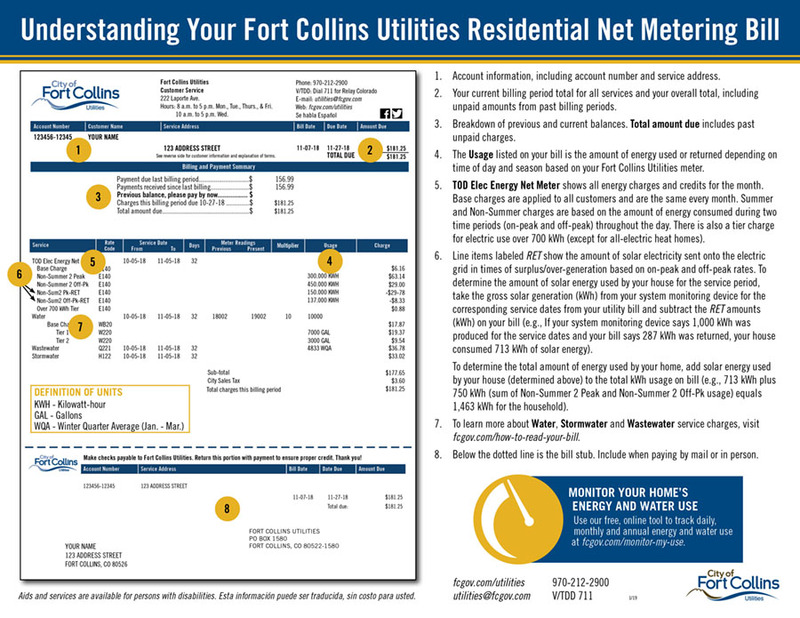 Fort Collins Utilities verified TOD rate assignments based on whether a residence is heated primarily by non-electric heat sources (gas furnaces or gas boilers) or by all-electric heat sources (electric baseboards or electric heat pumps) according to Larimer County Assessor records. Residential customers with gas furnaces or gas boilers (approximately 90+ percent of customers) are on the TOD Rate. Residential customers with electric baseboards or electric heat pumps (homes without gas heating) are on the Electric Heat TOD Rate. This rate applies to all residential customers who have a gas furnace or gas boiler that serves as the primary heat source. This rate applies to all residential customers with electric-resistive (all-electric) heating as the primary heat source for the home. Residences heated with a gas furnace or boiler for any portion of the home. Credits for returned energy do not have a tiered rate component. For an example of your community solar bill, click here. Community Solar customers will continue to receive credits for solar energy returned to the grid by the Riverside array, based on the off-peak and on-peak hours as shown below. 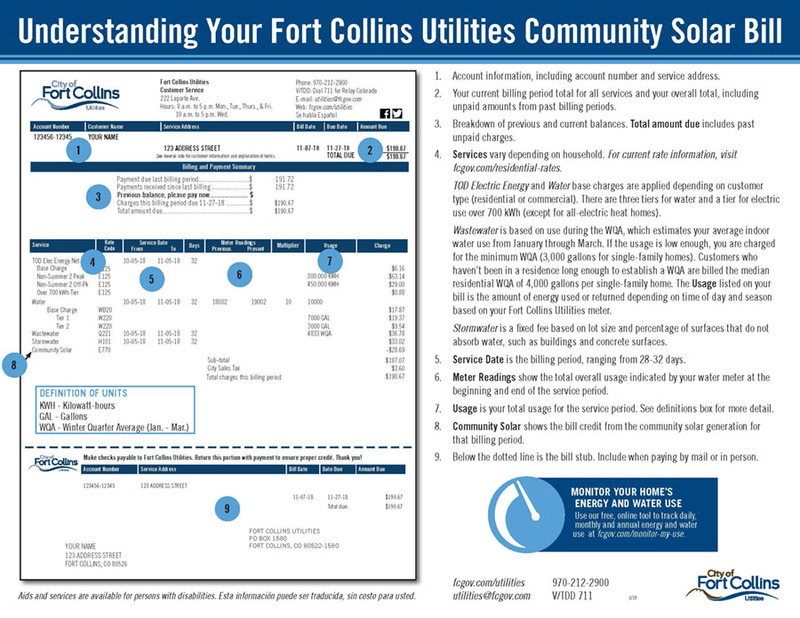 Fort Collins Utilities partners with local organizations to provide efficiency, conservation and bill payment assistance programs, including the Payment Assistance Fund and Income-Qualified Assistance Program, through our Affordability Portfolio. Income-Qualified Assistance Program (IQAP) - Customers who qualify for the low-income energy assistance program (LEAP) may be qualified to receive a 23 percent discount on certain components of their monthly electric, water and wastewater bills. Utilities also has a Medical Assistance Program (MAP), which offers medical rate discounts for customers who require medical equipment and/or air conditioning for medical purposes. 'Starting' and 'Ending' electric reads will no longer show on customer utility bills because charges are now calculated on electric use during on-peak and off-peak hours for each day of the service period. 'Electric History' prior to the TOD conversion will not be available on bills, though electric history will continue to show from TOD conversion moving forward. The electric line item descriptions on your bill will be associated with your off-peak and on-peak energy use. If the billing period crosses between a non-summer and summer month, your bill will break out the use for each season according to the different prices. For detailed information, see the Fort Collins City Code Chapter 26, starting with section 26-462.